Have an Australian residential address and mobile phone. Be a Qantas Frequent Flyer member. Not already be a Qantas Premier primary cardholder. Concierge The Qantas concierge service, dedicated to Qantas Premier cardholders, is just a phone call away, anytime you need assistance. It will take the load off you by helping with discounted Domestic companion-fare bookings, travel destination and shopping information, medical and travel assistance, and much more. Airport Lounge You will be entitled to 2 complimentary invitations after you activate your Qantas Premier credit card. Fraud Protection Feel safe with the built-in protection of Mastercard Zero Liability. Receive 70,000 bonus Qantas Points when you spend $3,500 within the first 90 days of your card approval, plus 30,000 points on your first anniversary. (Points are ordinarily credited within 6-8 weeks of meeting the spend criteria and 12 weeks from your card anniversary.) Pay half annual fee of $149 in the first year. (Standard annual fee, currently $299, billed in subsequent years.) 0% p.a. 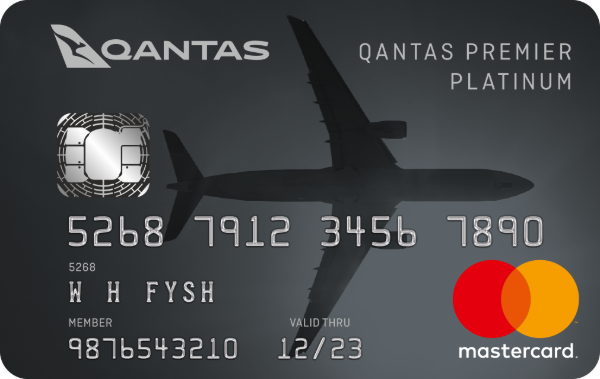 on balance transfers for 18 months for new Qantas Premier Platinum credit cardholders. No interest free days apply to retail purchases whilst there is a balance transfer. Reverts to the cash advance rate thereafter, currently 21.99% p.a. Discounted companion fares - Save up to 20% on selected domestic flights for you and up to 8 companions booked through your concierge using your card. Interest Free Purchases - Enjoy 6 months interest free on your first purchase of selected Qantas products and services. No interest free days apply to retail purchases whilst there is a balance transfer. Late Payment Fee: $30 will be charged each time Qantas does not receive the Minimum Payment Due and any Overdue Amount by the payment due date, debited to your Account after the payment due date. The Minimum Payment Due, any Overdue Amount, and payment due date are detailed on your statement of account. When you make any purchase or cash advance in: Foreign currency once converted to Australian dollars; and/or Australian dollars (or any other currency), when either the merchant or its financial institution/payment processor is located or registered overseas, including transactions that involve dynamic currency conversion (that is where a transaction denominated in a foreign currency is converted to local currency which is a service that is offered by certain ATMs and merchants). The process of conversion and the exchange rates applied will be determined by the relevant ATM, merchant or dynamic currency conversion service provider as the case may be. We do not determine whether a Card transaction will be converted into local currency by the merchant or ATM and You may have to check with the relevant merchant or ATM provider. Note: It may also not always be clear that the merchant or its financial institution/payment processor is located or registered outside Australia.